The Pace seems more like a Stratos that's wrapped in a sleeker body, which is not a terrible thing as the Stratos was a neat little device. 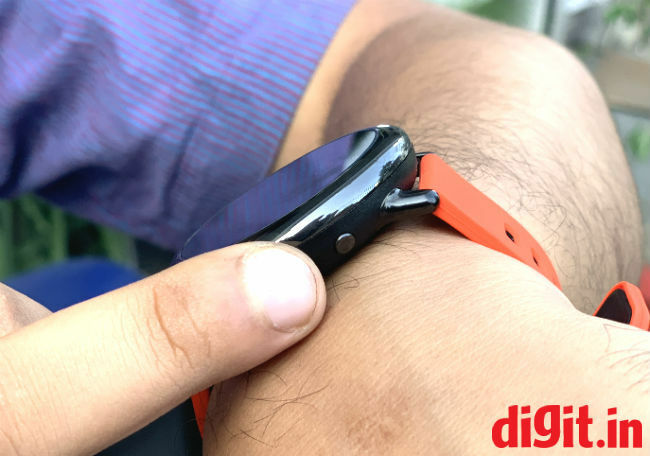 Xiaomi’s Amazfit may be new to the Indian market, but the company seems to be intent on making up for lost time in its quest to dominate the wearables market. The company has already launched four new devices in the market including the Amazfit Pace that I have with me right now. 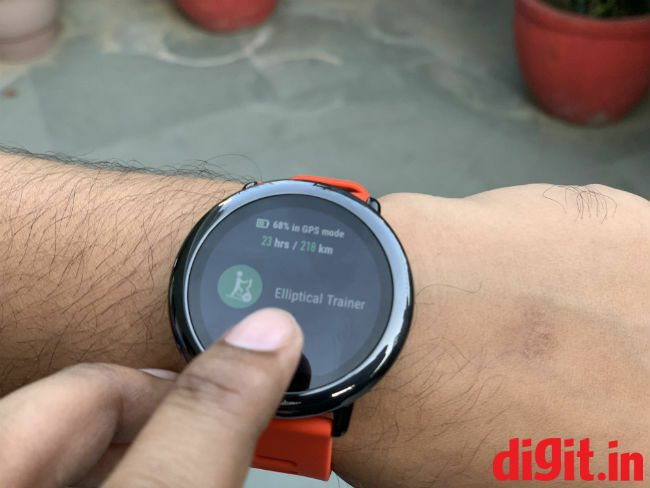 The Pace is priced at just under Rs 10,000, and seems to take a lot of cues from its elder sibling, the Amazfit Stratos (review). Let's take a look at how the wearable fares. The Amazfit Pace features a very different look as compared to the Amazfit Stratos. While the Stratos features a rugged, sporty look, the Pace is more sleek and shiny. The Pace may feature a round dial and a ‘flat tire’ similar to the Stratos, but that’s where the similarities end. The Pace sports a large shiny bezel and just a single physical button as compared to the three buttons found on the Stratos. However, this single button is sort of recessed away. It’s closer to the underside of the watch and does not stick out as much. As a result, you get a perfectly symmetrical look when you look at the watch head-on, something that I think the designers of the wearable were going for. The physical button is only used for waking up the Amazfit Pace and jumping to the home screen. My problem is that since the button is recessed away, pressing it is quite difficult, especially when you are in the middle of a workout. It’s a clear example of form over function. I turned on the tap-to-wake function almost immediately, which isn’t the fastest or easiest function to use when working out, but it was still easier than fiddling around with the button. Flip the Pace over and you’ll see the optical heart rate tracker as well as the latches on the strap that will let you swap them out for new ones. Speaking of the straps, they feature a standard buckle system for locking in place. While design is subjective, the Pace’s rounded appearance and more subtle looks should appeal to a wider demographic than the Stratos. Of course, the bright orange straps on my particular Pace aren’t exactly subtle, but there is another black variant of the wearable. 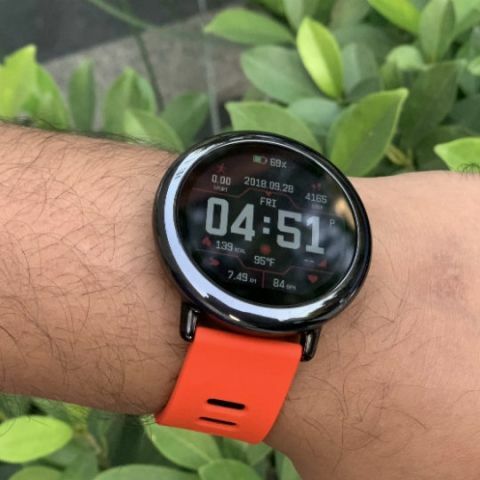 The Amazfit Pace features a 1.23-inch display and just like its elder sibling, the Stratos, colours on the watch look a little dim and faded out, but it is still legible under direct sunlight. In fact, it seems like the display on the Pace is exactly the same as the one used by the Stratos. It should also be noted that the watch also comes with an always-on display feature. This means that you can simply glance down to look at the time, without the need to wake up the watch. Of course, the feature will have an impact on the battery life of the device, but the screen of the wearable goes into a sort of low-power mode when not in use, instead of turning off completely. I’ll talk more about this in the Battery section. The Pace also sports a 'flat tire’ display. However, this doesn't seem to bother me much as it doesn't hide any information. The UI on the watch is the same as the one used by the Stratos, with one major difference. While the Stratos had three buttons to navigate, the Pace only has one button. As a result, the Pace is heavily reliant on gestures. This was a bit of a problem considering the Stratos’ UI was unintuitive to begin with. The simplest way to get around is to remember that swiping left takes you a step back and pressing the home button takes you to the home screen. Like the Stratos, the Amazfit Pace offers a number of features. This includes weather updates, built in compass, sleep tracking and more. In fact, you get the same features as the Stratos for less, which is a very good thing. The Pace is not a smartwatch, at least not one in the traditional sense. You do get notifications for calls and messages, but you can’t do anything more than read them. You will have to open the message or call on your smartphone in order to take any further action. So if you were hoping to use the Pace as a smartwatch, you’re out of luck. The Amazfit Pace carries with it the same benefits as well as well as caveats as the Stratos. You get a lot of fitness activities that you can track, but most of them are outdoor activities. There is no dedicated 'workout’ mode for those of you who just like to hit the gym. Regardless, you do get inbuilt GPS, which is a feature not as common in wearables. 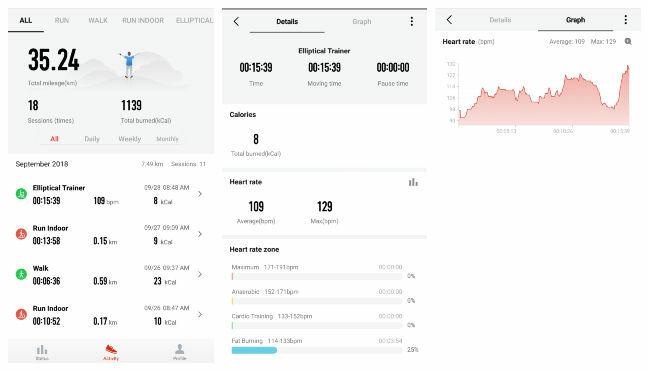 As such, it will be able to track your runs or jogs more accurately and most importantly, you wont have to rely on your smartphone with you to do it. However, the GPS is best used outdoors in an open area, otherwise, the route accuracy gets sketchy. Further, I felt that the GPS lock-on speed on the Pace was slightly slower in comparison to the Stratos, with the Pace clocking about a minute and a half to two minutes to get a lock on. Since the watch doesn’t track route without a GPS lock (obviously), you’re better off doing your warm ups till then. Once its locked on, the watch will vibrate to let you know. It should be noted that while the steps as well as the route seems to be quite accurate, the floor counter is a hit-or-a-miss with its accuracy. I am not a fan of running, but i did track my ‘walks’ during my commute. Like the Stratos, the Pace gave me more information than I could shake a stick at. This includes mileage, calories burned, pace, speed, heart rate, heart rate zones, cadence, and stride. There is no specific option for workouts or weightlifting, which would disappoint gym-goers and even guys like me who work out a little bit. I follow the seven minute workout plan which sees me do 12 exercises in rapid succession over the course of 7 minutes. After trying out the various option, I have found the elliptical workout option to be the closest to offer the information I want. 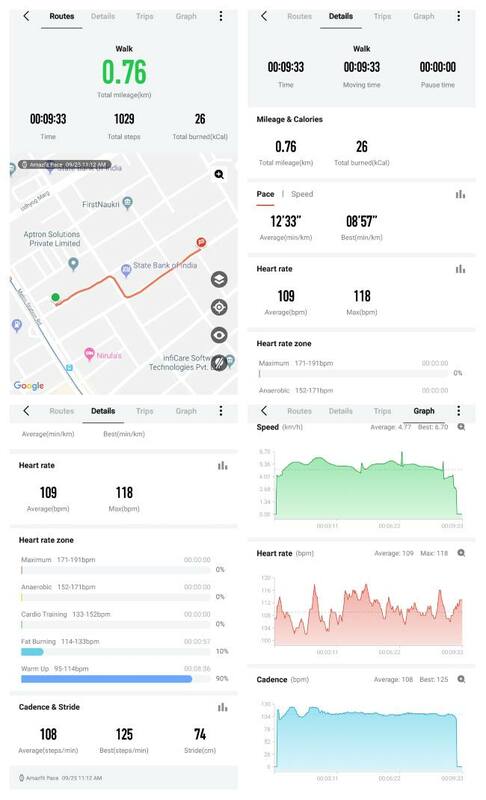 However, considering the staggering amount of information that the Pace offers for other activities, the information I got for my particular workout was barebones and consisted only of a graph for the heart rate and the heart rate zones like warm up, fat burning, cardio training, anaerobic and maximum. 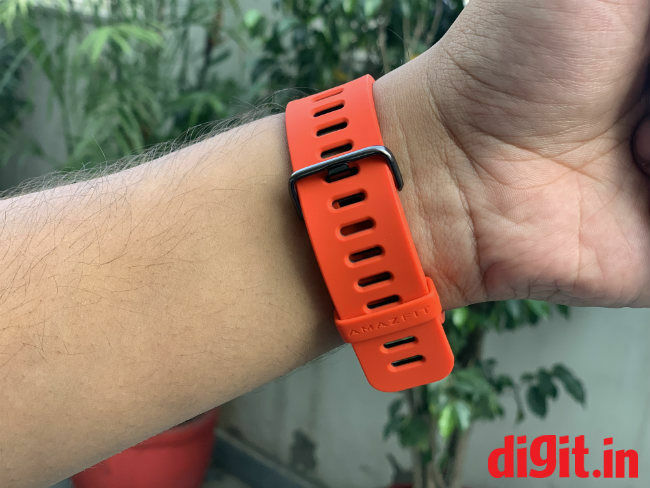 This is similar to what I would get in something much more affordable like the Xiaomi Mi Band 3 (review) or the Lenovo HX03F Spectra (review). In short, the Amazfit Pace works best if you are the type who prefers outdoor workouts like running or even cycling. Indoors, it's best used with a treadmill or an elliptical machine. 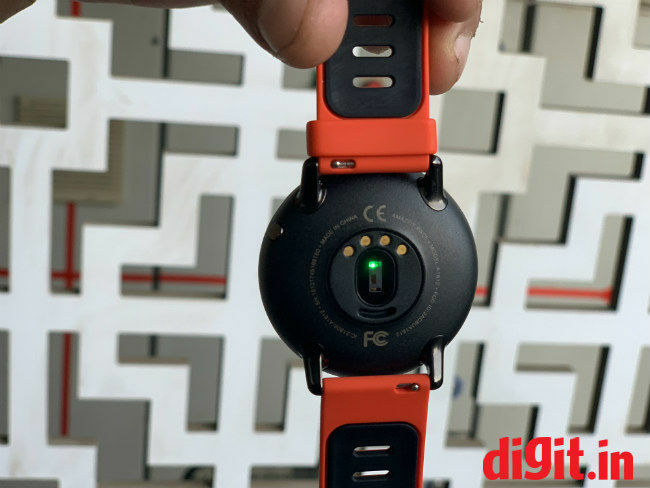 The Amazfit Pace managed to offer a battery life of four days, which isn't too bad considering it has an always-on display and a GPS that it needs to power whenever the wearble is tracking an activity. This is also similar to what you get with the Stratos. I’m sure the Pace would offer a better battery life if you had the option to turn off the always on display. This also means that you get a similar charging cradle as the Stratos, however in the Pace, it's smaller and feels flimsier. 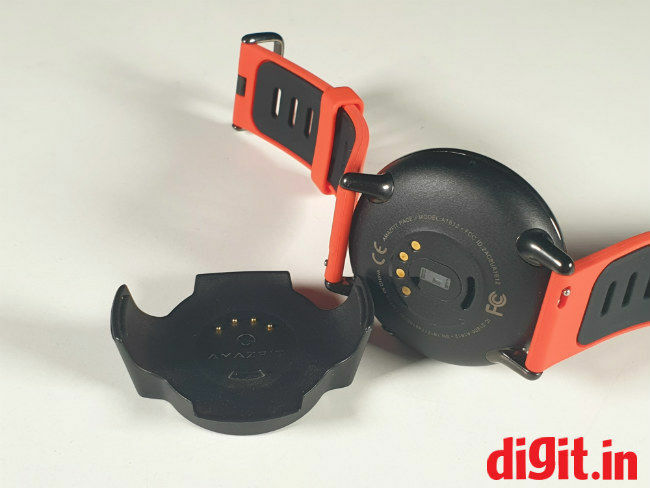 You will have to snap on the wearable to the cradle in order to charge it and pry it off once done since there is no magnetic system in place. I shudder to think what would happen if I accidently broke one of the edges in the cradle that hold the Pace in place. I don't know if you've noticed, but in this entire review, I've been comparing the Amazfit Pace to the Stratos and it's not something I did intentionally. Both devices are so similar that I'm getting a sense of deja vu as I use the Pace. In fact, the Pace seems more like a Stratos that's wrapped in a sleeker body, which is not a terrible thing as the Stratos was a neat little device. On top of this the Pace is priced at just under Rs 10K. If you've got a strict budget, the Amazfit Pace is definitely worth taking a look at. However, if your budget is a bit more flexible, you can also check out the Samsung Gear Fit 2 Pro (review) that offers a smaller, albeit better AMOLED display, features a dedicated workout mode and offers a bit more as a smartwatch. However, it has a battery life of about two and a half days, so you’ll have to take that into consideration. can any one give exact review of ausus zenfone 5 intel version? Please do a review of Obi Hornbill S551 Mobiles?